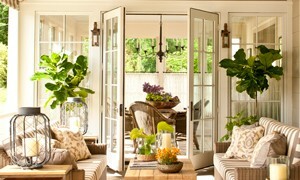 The subtle color palette of the porch furniture blends with the rustic views surrouding the house. Ample seating allows for a comfortable perch for visitors. Spool beds became popular with American furniture makers in the mid 19th century. This bedroom’s impressive example combines graceful spools, four tall posts (a Southern addition), and a pretty painted finish. In the second-floor suite, Phoebe gave the small space big impact by covering everything in the same fabric. On the first floor, rich brown walls and a combination of neutral fabrics carry out a warm mushroom-and-ivory color palette. Front and back doors open directly into a two-story-high living room, where spruce-planked walls and wood beams salvaged from an 1890 Tenessee barn reflect the home’s rural setting and give the space a refined, barnlike feel. For more information about the Southern Living Idea House as featured in House & Home click to see the full article here. Design consultant and blogger Kristie Barnett reviews the holiday decorations at the Southern Living Idea House on her blog the Decorologist. Regional blogger Thistlewood Farms recently toured the Southern Living Idea House and shared some great holiday decorating tips. The folks at Southern Living have created a 2 x 4 foot gingerbread reproduction of the 2013 Idea House. Pick up the December issue or follow the link for full instructions and pictures. On the edge of the property, two miniature versions of the main house—known affectionately as “bunkies”—serve as a visual gateway into the compound. Tile is a pretty and practical choice for the light-filled laundry room. For interest on the walls, Phoebe used two colors of the same small mosaic tile in wide stripes.